Although the season is coming to an end, as you pass through the front doors you’ll notice an ample size terrace where you’re likely to see groups of people drinking late into the night. The interior is bare, with high ceilings and full length windows. The cocktail list is reasonably priced and has some maturity to it’s offerings. We started with a basil smash & blueberry mojito and then moved on to a ginger caipirinha and mint julep. I found the basil smash a little too sweet, but I am on an old fashioned kick right now so take it in context. I particularly enjoyed the caipirinha which had a strong citrus kick and a good hit of Cachaça. Not ones to fight the menu, we ordered tapas and let our waiter guide our choices. The fresh Tomato and mozzarella was simple, crisp way to start off the menu. 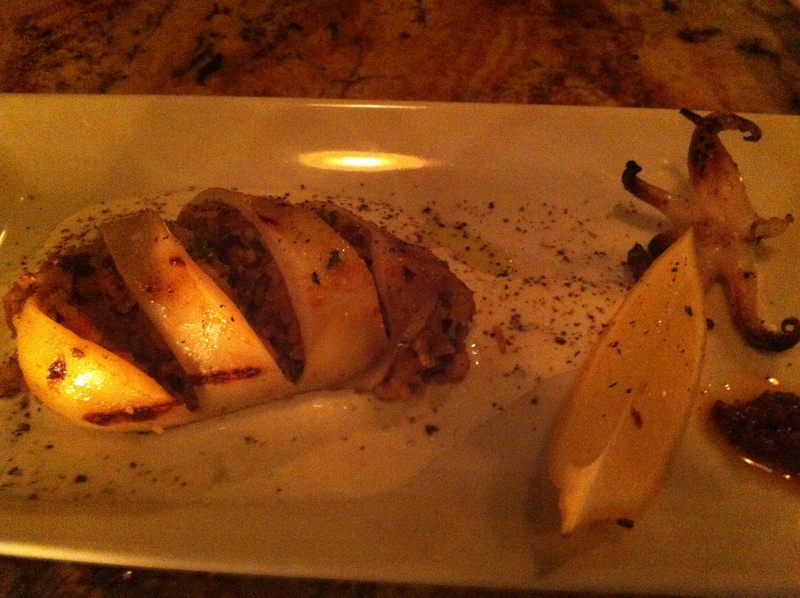 Our other vegetarian dish was the stuffed roasted eggplant with onion confit. The dish was served cold and may have benefited from some additional seasoning. The highlight of the menu was without a doubt the Grilled Calamari – not surprisingly as it was highly recommended by a friend who is a regular. The squid was cooked just right and stuffed with zesty olives and spicy chorizo – perfect with harissa yogurt sauce. The potato tart was a hearty dish with chorizo, soft roasted peppers covered in creamy egg yolk. In retrospect, it’s safe to say this menu leans heavily on sausage. The grilled merguez with goats cheese slaw was good – but we both felt something was missing from the dish. The sausage was good and the slaw was tasty but the two components seemed a bit disconnected and was missing any element of surprise. It’s difficult not to enjoy Voro. One must keep in mind that this restaurant isn’t trying to be bold and you might not get many “likes” if you instagram your plates here. 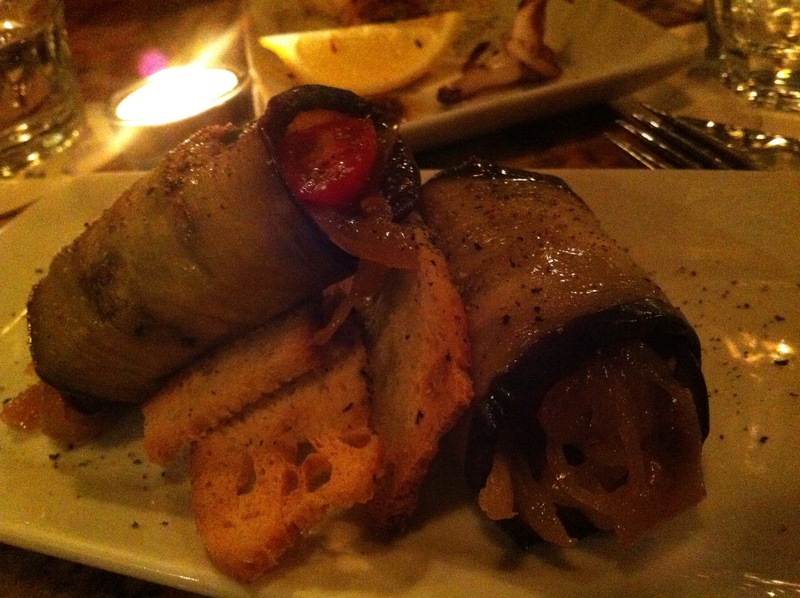 It’s humble place serving well executed, no nonsense Mediterranean tapas at very reasonable prices. It’s somewhere you can go out to eat on a weekday when you don’t feel like eating at home – still feel spoiled but without the bank account guilt. Tags: Cocktails, Fairmount, forkandtell, Italian, Mediterranean, Montreal, Squid, Tapas.